There’s a lot to learn at Inbound, HubSpot’s week long conference in Boston, but this year, I created my own session. I learned how sponsors increase brand awareness, generate leads, and make sales at conferences by asking the people in the trenches for their best tip while working the booth. Not everyone is cut out to generate leads and sales from a conference booth. You have to consultative, engaging, and ultimately be effective all while starting out your interaction knowing next to nothing about the prospect. Natalie Meshbesher, a Partner Marketing Specialist from Siteimprove, let me in on something that they are piloting, so know that this is a work in progress! Siteimprove is optimizing for both the number and quality of leads. They used to have a big giveaway, like a Nintendo (which I will gladly take by the way). They got a lot of leads, but they had to kiss a lot of frogs till they found a qualified lead. Now they are trying a new giveaway: a course on web accessibility. It’s valuable content and if you take them up on it, chances are you are their buyer persona. This smells like a winner! Several sponsors said to keep focused on the prospect's needs with meaningful questions. Amit walked me through his process at the booth, and he practices what he preaches. Opensense is an email signature marketing application, so if you get to a demo, Amit sends you an email to demonstrate Opensense. ...Side note, it’s always nice when your product lends itself to getting a lead’s contact information as part of the demo! After a couple of clicks and swipes, Amit was able to show me data and explain the capabilities of his tool along the way. Victor Santoyo, a Sales Consultant for Sucuri, shared a cold, hard truth. Conferences only last so long as there’s more people than there is time to talk with all of them. For Sucuri, that means asking about security early on in the conversation. It’s still a consultative process, but if bigger picture aspects of their business are irrelevant to whether they are a good fit for your product, there’s no need to ask for the elevator pitch. Indeed, most of the products at Inbound had integrations with HubSpot and many of the vendors are HubSpot customers as well. This isn’t to say that everyone is of the same mind. Rob Hugen, a Business Development Representatives with Applink.io, advises to talk to everyone. If generating awareness is one of your goals at a conference, this is a good approach. Depending upon your product or service, “talk to everyone” isn’t a bad plan either. You might not be talking to a hot lead, but you planted a seed in a future referral source. Too often, we don’t play the long game or recognize the power of serendipity because it’s hard to track or it just gets lost in the tyranny of the immediate. Especially if there isn’t a line of people waiting to talk to you, why not? The other benefit is that activity at your booth often begets more activity. Chatting with someone who isn’t the greatest fit just might create a welcoming environment for your next customer to jump into the conversation. Kathryn Nyhus, Head of Product Marketing at Coschedule, shared with me how Coschedule kept prospects at the booth: pour over coffee. ☕ Why pour over? ☕ It takes a couple of minutes to make so you have a captive audience long enough to qualify the prospect. You can take this too far and hold people hostage, but a couple of minutes for a cup of joe makes sense for the attendee and folks at the booth just the same. At a lot of conferences, vendors use lead scanners to simplify the lead collection process. Inbound doesn’t allow lead scanners, and that means reps at vendor tables need to grab business cards and get that data into their CRM or marketing platform manually. 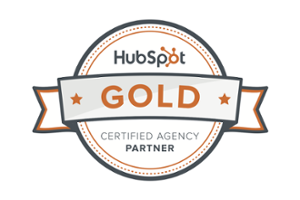 You get a lead, it goes right into HubSpot and you can start your drip campaign. Doing this quickly can drive that one time visitor back to the booth during the conference for further nurturing or heck, a sale. Disclaimer: I have a favorite vendor at Inbound and it’s SEMrush. They are fellow Pennsylvanians, have an incredibly valuable tool especially now that HubSpot discontinued keyword rank tracking (cough cough), and Krista Tidman, their Customer Success Manager, is good peoples. In fact, I met Krista at an Inbound several years ago, saw her again at the Digital Marketer conference in Philadelphia the following year, and she not only recognized me but remembered my name. Considering she meets a zillion people in any given year, she either did some research about who was going to the conference that had met before or has a mind like a steel trap. Either way, I was impressed. That’s a slick way qualify a lead and get their contact information. Your prospect is doing much of the heavy lifting, and over time, I would think that SEMrush could crunch the numbers and take an analytical approach to increasing the number of qualified leads from the quiz. Ding! This is an obvious one that is all too easy to forget. You might be focused on lead gen or approach the conference with brand awareness in mind, but someone’s gotta make it rain! You can’t take orders if you don’t have the capacity to do so. Chris said to bring paper order forms specifically. If no one comes to your booth, you’re not in the game. Swag is one way to bring people in, so you can learn more about their business and find out if they are a good fit for your product or service. Alas, sometimes there just aren't easy answers. Swag can bring people in, but the guy who has to leave the conference with every free pen probably isn't a real buyer. You'll find vendors on both sides of this and those trying to find a balance. In fact, ReachForce had a really slick implementation of this advice at Inbound. Melissa Smith, Marketing Coordinator, told me about Super Marketing Heroes scavenger hunt that they arranged. 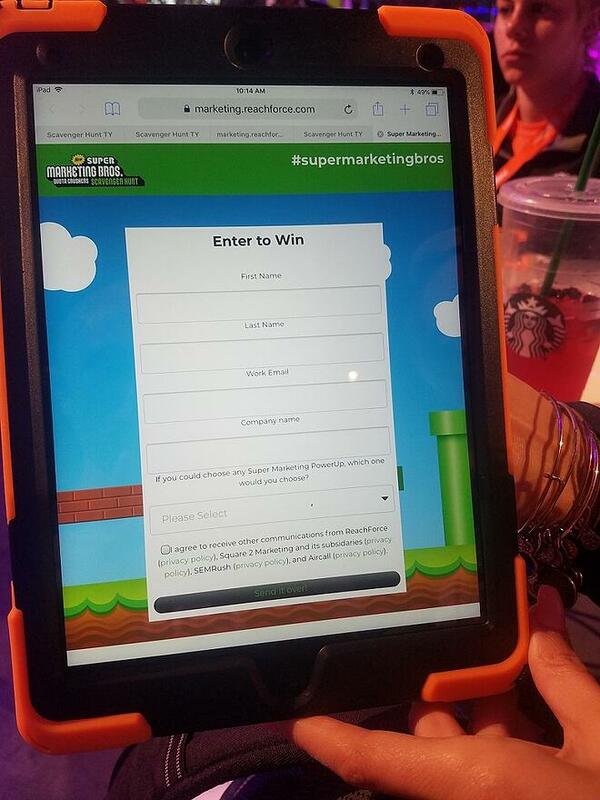 They coordinated a scavenger hunt contest with a number of other vendor booths, and when all was said and done they generated more leads from the scavenger hunt than they could have on their own. To be really honest, at first I thought that this tip was a little superficial maybe even self-serving, but there’s more to it! At a conference, your biggest competitor just might be three doors down and for interested prospects, you’re running through demos. If your product isn’t polished be selective about the conferences that you attend or buggy demos and slick competitors could take the wind out of your sails. When you start talking to a prospect, a surefire way of losing them is not being able to adequately answer their questions. I was surprised at the senior level people at the vendor booths at Inbound, many people in the c suite and CEOs, but it’s common to see people who don’t have product knowledge. To get leads and sales from conferences, it’s critical that companies send people who can answer tough or rare questions. Justin Keller, VP of Marketing at Sigstr uses an event strategy to generate more leads at the booth. Sigstr throws an after party, “All About Margaritas,” but you have to register to get in, and, here’s the golden nugget, stop by the booth where you get a sticker to put on your ID. That sticker is your ticket into the event. This process generates foot traffic at the booth and turns conference attendees into walking billboards. “Have a presence outside of the booth.” - Tom Hickey from Gartner Digital Marketers. Gartner sure did at Inbound 2018! They hosted a huge welcome party and had a presence at two other locations at Club Inbound in addition to their booth. Tom noted that after the party people would come up to the booth just to thank them for the food and drink they provided. That’s a great position to be in! People are coming to you and already have a positive opinion about the brand. Rebecca Seligstein from AdStage had a tip about signs. Make sure your signage appeals to your buyer persona and explains a little bit about what your product does. Many conferences provide a sign but it’s often just the logo including at Inbound. Having additional signs and screens to add a little depth to your booth’s presentation is a great idea to draw in the right people. 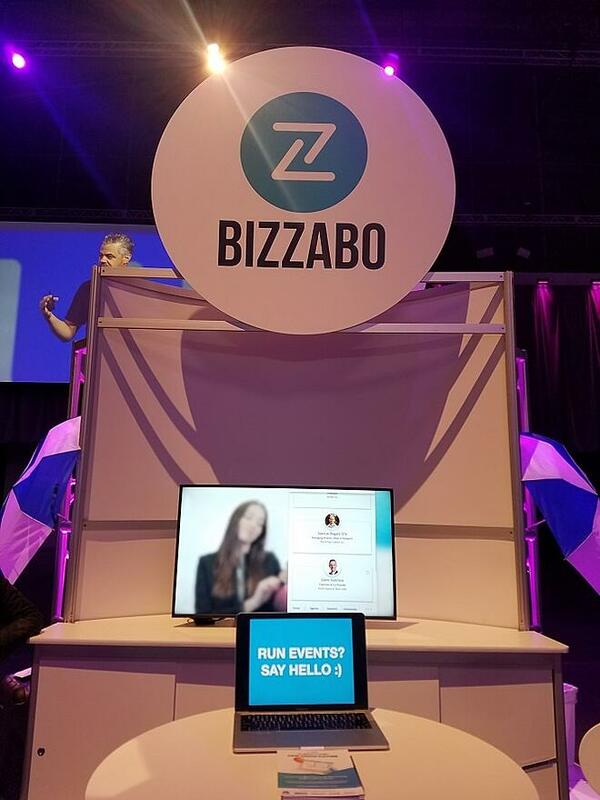 Along these same lines, Bobby Ferla, a Senior Account Executive at Bizzabo, told me that I would be surprised about how many come to their booth based upon the simple message that they display on their MacBook, and I was! You don’t need “War and Peace” to grab the attention of your buyer persona. You just need to spark their interest with some words or ideas that they care about. An interesting take on getting value out of a booth at a conference came from Daniel Waas at GoToWebinar. While they generate leads at conferences, I was surprised to hear that they focus on meeting existing customers, showing them new features, and even bring an engineer or two to get technical feedback from customers. This process sure isn’t scalable but I’m sure it helps turn customers into brand evangelists. If you’re repping a product with sizable market share and brand awareness, this concept might be worth testing out. When I stopped by GetAccept’s booth, they didn’t just have a tip, they had a whole video! GetAccept’s founder, Carl Carrell, directed me to a YouTube channel and this video where they hacked a big conference in San Francisco, SaaStr. Ultimately, we're talking about how to make conferences more profitable for your business. We put together this handy Google sheet that calculates the profitability of a conference booth for you. Easy peasy.